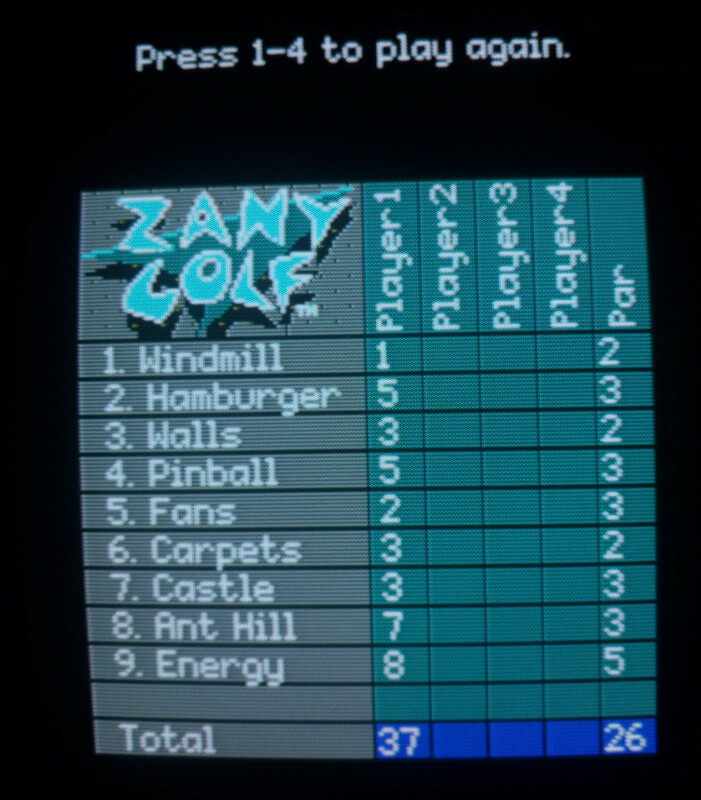 I haven’t managed much gaming over Xmas but did have some time on new years day and decided to dig out a game I remember spending quite some time on years back, Zany Golf. If you’d asked me a couple of days back, I’d have said I played this loads on my first PC but since it doesn’t actually support CGA I’m clearly misremembering. I don’t recall ever actually finishing it at the time but may be wrong about this also. At any rate, I thought I’d give it another go and see if I could beat it this time around. The box is relatively small as PC games go coming slightly before they all got supersized. There isn’t much of a manual but there is a code disc which is required every single time you beat the first level of the game to get to level 2. They could at least have only required it the first time but no such luck. The back of the box shows screenshots from the much more colourful IIGS version of the game. This is one of the very few titles that was originally made for that system back in 1988. 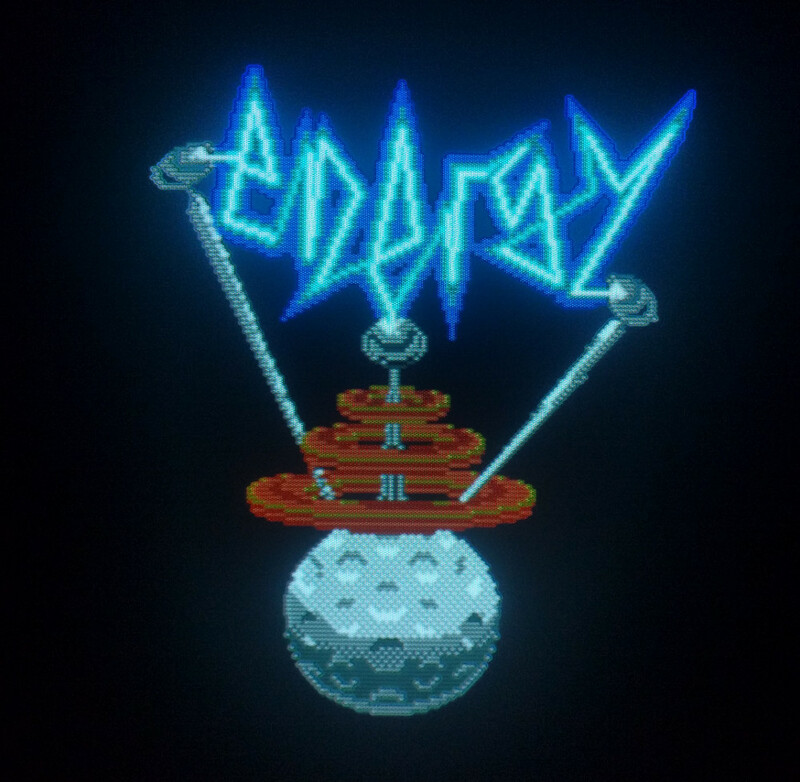 I did try this out on the IIGS and aside from the better graphics, it also uses the sound capabilities to great effect and is definitely the better version of the game. It doesn’t appear to have keyboard control being mouse only which can make gameplay slightly harder on a handful of shots where being able to move the cursor in a straight line comes in handy. Worse version or not, since it’s the one I played years back I’m sticking with DOS. 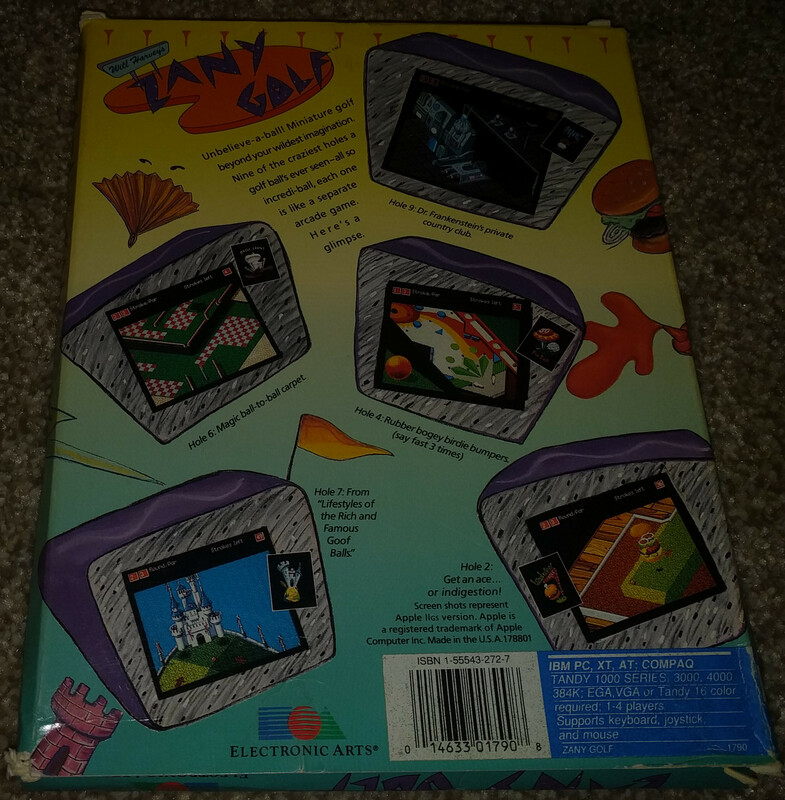 Zany Golf was an Electronic Arts game which at this point in time meant the authors got a bit of a writeup on the inside cover. Admittedly, this would require a whole lot more text for modern development teams. As for the game itself, it’s a sort of crazy golf game where you have to play through 9 holes without running out of shots. Each hole has a par score and you are given this many shots at the start of each new hole in addition to the 3 spare shots you start the game with. The “zany” part comes in as these holes are not the sort of thing you would find on a conventional golf course. The possible exception is the first hole which has a very traditional windmill to aim for. Aiming is done by clicking on the ball and pulling back the cursor in a given direction. Further away hits the ball harder. It’s a decent system and feels to me like pulling back a spring in pinball, except I also get to rotate and aim it here. 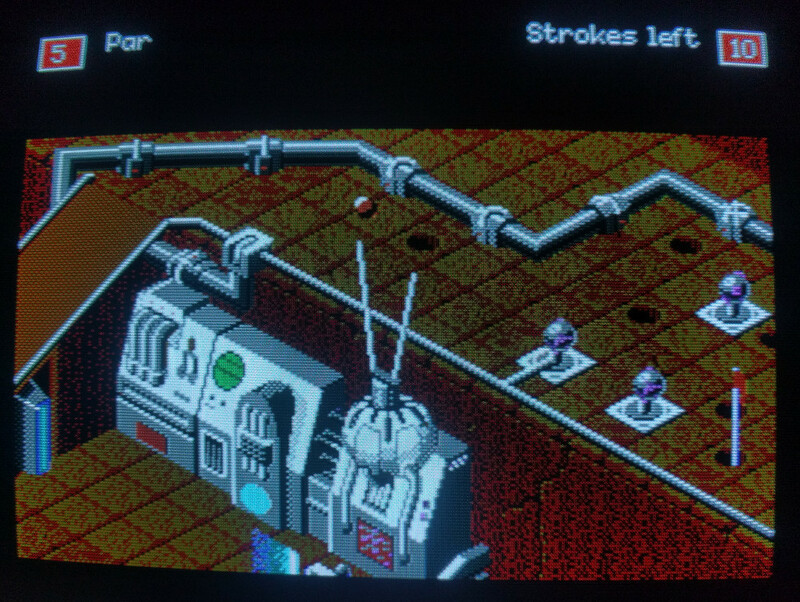 I’m playing this on my Tandy TX which is a first for me as I’ve always played it in EGA prior to this. The colours are slightly more restricted but I’ve yet to play a game where this makes all that much difference. It also uses the extra voices to good effect for the in game music which was of the truly beepy variety on the original PC. 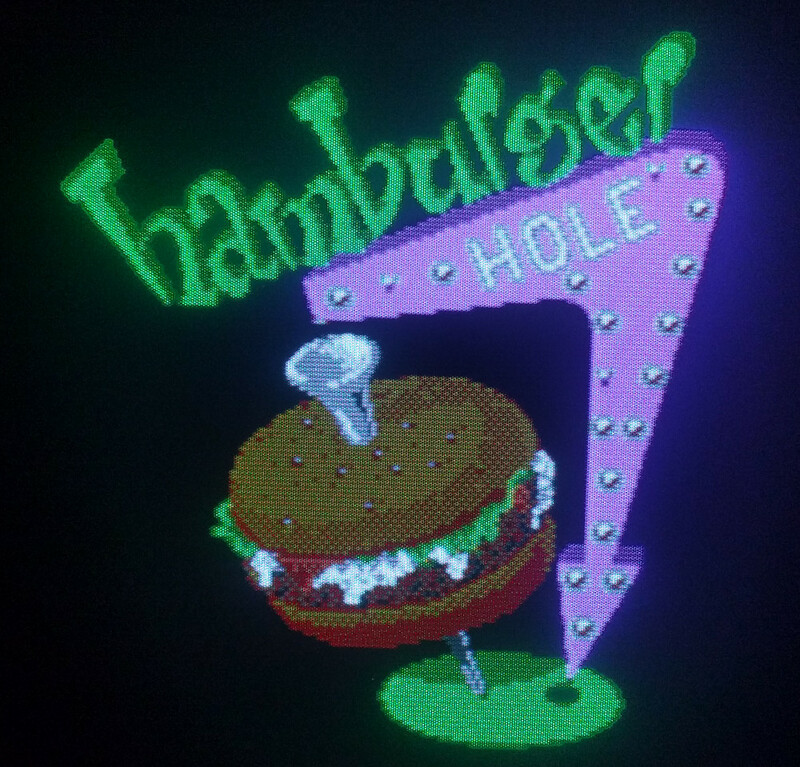 The zanyness starts to ramp up in the second hole in which the hole is underneath a bouncing hamburger. Clicking rapidly makes it bounce higher. It’s around hole 4 that things start to get more original. There are fans and magic carpet holes. The first of these has lots of fans placed around the course which can be spun by clicking and will blow the ball in the right direction. The magic carpets (the red checkerboards) take this a stage further allowing the cursor keys to move the ball when it’s sat on them. The pinball hole is one of the more frustrating relying on a large amount of luck. Two drop targets have to be hit before the ball goes in the hole at the top left. Like any pinball there is lots of luck but this doesn’t have the precise aiming or nudge to placate this. You can’t even press just one flipper at a time so this is a very easy hole to lose lots of shots on through no fault of your own. 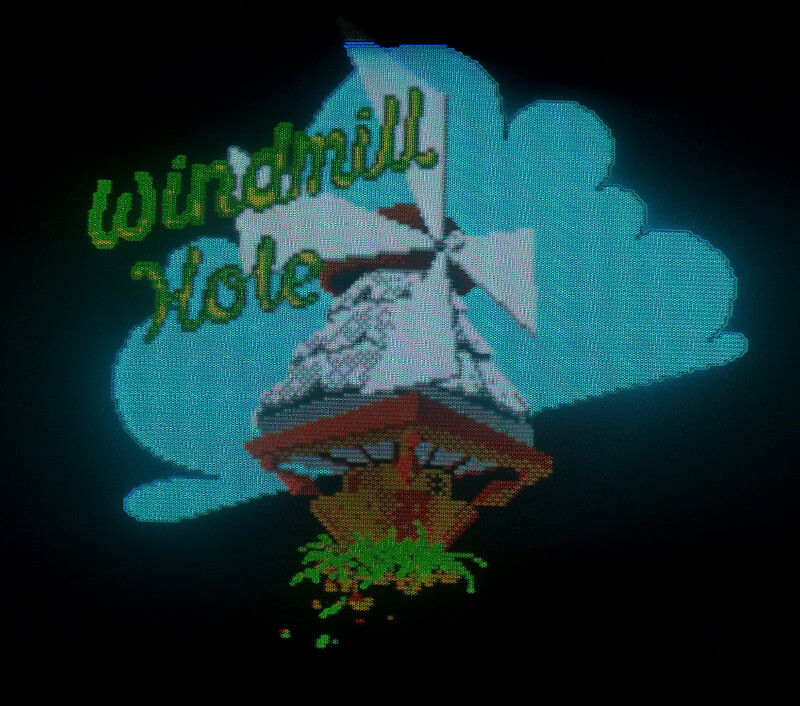 Bonus shots are available for specific actions within the game such as getting the ball in the windmill or alternatively striking a fairy (the little pink thing with wings). These appear at random and give around 4-5 bonus shots when hit. I found that beating the game relied quite a bit on when and where these guys would appear. The last level is the trickiest and if I didn’t beat the game 30 years back, it would be here where I got stuck. Two buttons have to be struck on a computer, then the ball needs to be hit into a funnel that moves it up to a higher level. There are ball destroying lasers and energy fields to be avoided and this first part alone is very tricky. This higher level is full of holes which need to be avoided and energy spheres which catapult the ball around if hit (usually straight into one of the previously mentioned holes). This final hole is kind of evil. I guess it could be beaten in par but it really wouldn’t be easy. Other than pinball, the rest of the holes are reasonably fair and could probably be done in/under par fairly consistently if you don’t head off chasing fairies. At any rate, I eventually got to the last hole with enough shots to spare to take my time nudging the ball slowly around the holes and beat the game. The reward is truly underwhelming as you just get shown the same scorecard as if you’d lost the game. 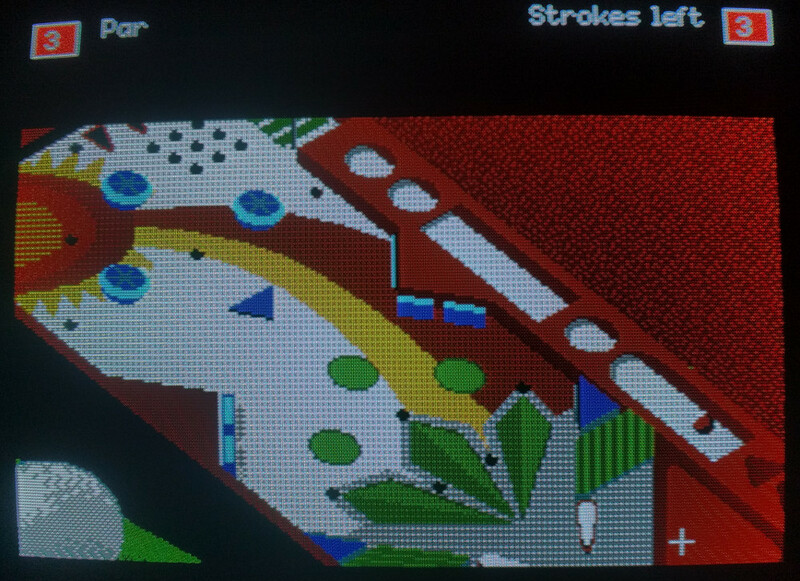 If you complete Zany Golf in/under par, there is a bonus level but I’m definitely not going to try for that. Alternatively there is a mouse-hole on level 9 that allegedly takes you there if you hit the ball in while the eyes in it are red. I had a look at this but on the Tandy, the eyes never seemed to actually change colour. This would actually be an easier way to beat hole 9 than the regular route. I’ll give it a go on the IIGS some time but I’m happy enough to just have got through the game for now. I’m slightly shocked at how short this game is having gone back to it. Mastering the course in par would certainly take some more practice but is very doable. A practice mode would be nice for this so that you didn’t have to play through the whole game to get to level 9 every time. This sort of arcade gameplay was pretty standard for the 80s of course so I can’t hold it against it. 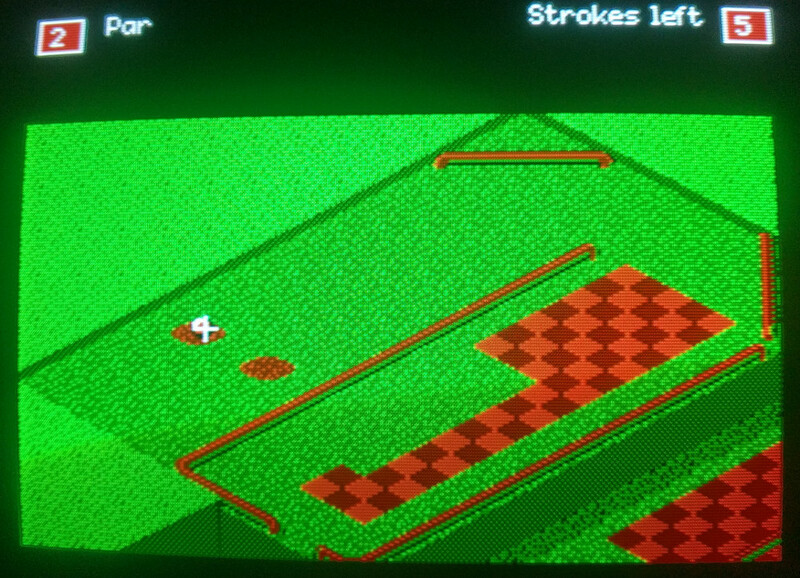 Zany Golf is a really fun distraction but quite short for a full price game to say the least. It’s quirky and full of character though and well worth a go now you can play it easily for free. 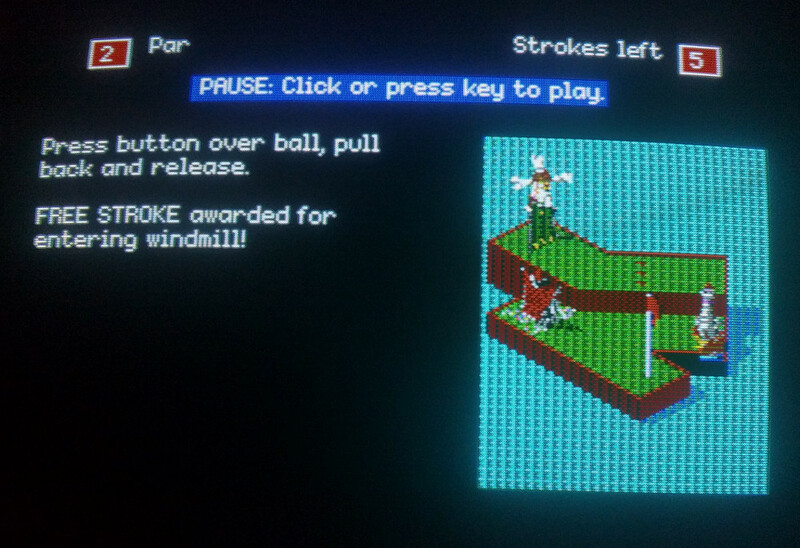 The developers had previously ported Marble Madness and I presume that much of that code formed the basis for Zany Golf. It still manages to be its own game and I wish it had seen a sequel or two. Out of all the ports, the DOS version is arguably the worse so you should go for the IIGS if possible. The Megadrive port missed out one of the holes, replacing it with the bonus hole instead. 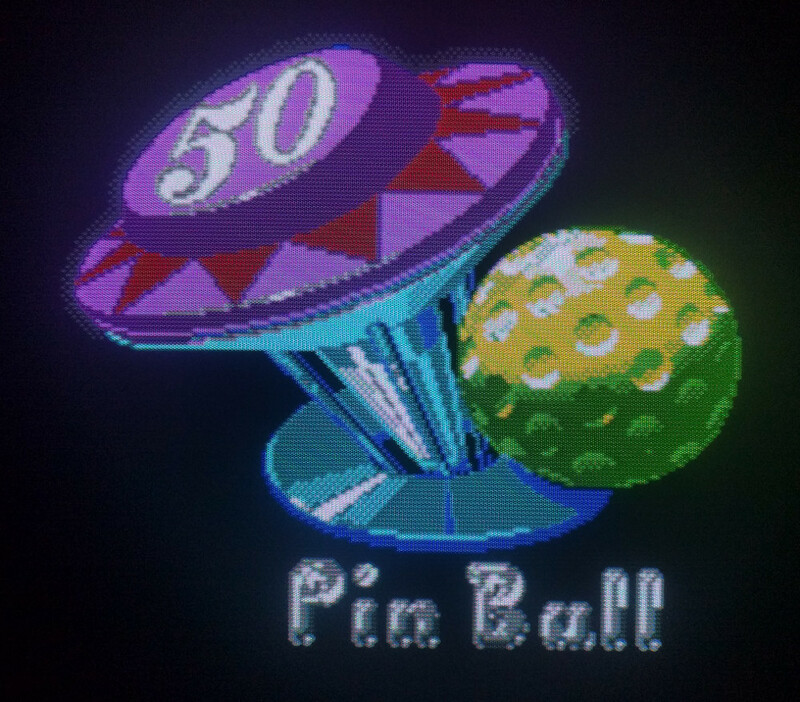 The Amiga port is similar to the IIGS with inferior music but better scrolling. This entry was posted in Off Topic and tagged Zany Golf by Pix. Bookmark the permalink.